It turns out there are more than one Hand of God weapons. Unfortunately, Supernatural Season 11 Episode 15 revealed that the Rod of Aaron was another one-hit wonder and now useless after Crowley wasted it on the demon Simmons. So does that mean all of the Hand of God weapons are one and done? And how many are actually out there? It was good to see that weapon concept carried over from Supernatural Season 11 Episode 14, but “Beyond the Mat” wasn’t an episode devoted to advancing the bigger plot. If anything, the whole Hand of God aspect during the hour simply reinforced a weapon to be used against the Darkness and was more so to get Crowley free from Lucifer’s clutches. But can I say that I’m over the scenes in Hell with all the worker demons bustling about? It’s rather tiring at this point, and I’d rather see Lucifer or Crowley out and about, not micromanaging and just sitting around. It kind of makes me miss the days when we viewers had no real visual clue what went on in Hell and had to imagine just how bad it was down there. And I can only hope that now that Crowley is no longer playing pet that he gets to do something interesting. It feels like for a series regular, he’s been sort of on the back burner for Supernatural Season 11. Standing up to Lucifer was a good step in the right direction, and I hope Crowley gets more to do as we head toward the end of the season. As for Sam and Dean, their story was ultimately just a side route with a few fun moments. 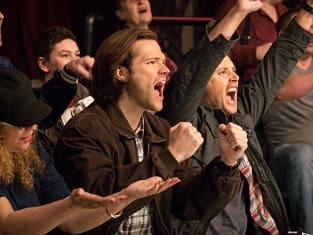 The best part had to be Sam and Dean taking in a wrestling match. It was a solid call back to their childhood memories with their dad, and it was just a fun diversion considering all the bad they have to currently deal with. Seeing them have fun is always a plus, and it was just funny watching Dean turn into a fan boy over his favorite wrestlers. Even his solo moment in the ring was humorous. I was surprised that Sam didn’t wind up with a hook up after what seemed like something of a connection with his first crush, but it was still good to see him and his brother enjoying themselves before the case of the week took over. The case itself was fine, involving a demon taking souls and a wrestler working for the demon, but it wasn’t anything amazing. Though, I did like that the wrestler chose to do something good and kill the demon in the end, even if that meant facing the hell hounds. And it was pretty cool to see the POV of the hell hounds again. At the same time, the concept of continuing to keep grinding was a loud and clear message. The brothers aren’t giving up, and they’re going to do what they can to get things done. Can you smell what the Winchesters are cooking? This was a fair episode, but there wasn't really anything that had me overly excited. If anything, I'm pleased to see the Hand of God story continue and glad that Sam and Dean got to have a little fun. Are you as big a wrestling fan as Dean? Will there be more Hand of God weapons? Sound off below, and be sure to watch Supernatural online now. 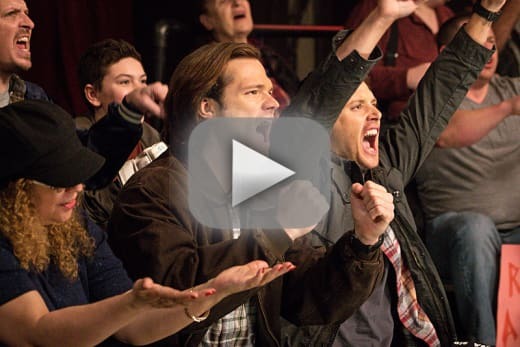 NOTE: Supernatural Season 11 Episode 16 airs March 23 at 9 p.m.